Welcome to the nursery! The baby for which this nursery is designed has not made her appearance yet, but we are hoping that it will entice her to come out! 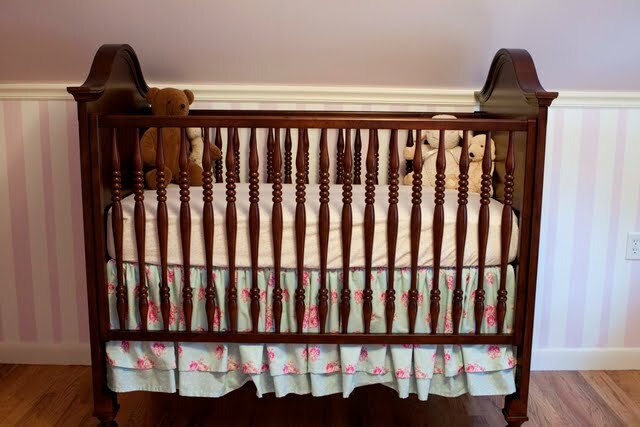 The crib skirt, curtains, and some of the basket liner fabric is from "French Hatbox" by Tanya Whelan. I did a LOT of fabric research before I settled on that one! My mom did a decorative painting technique on the walls to make the stripes. 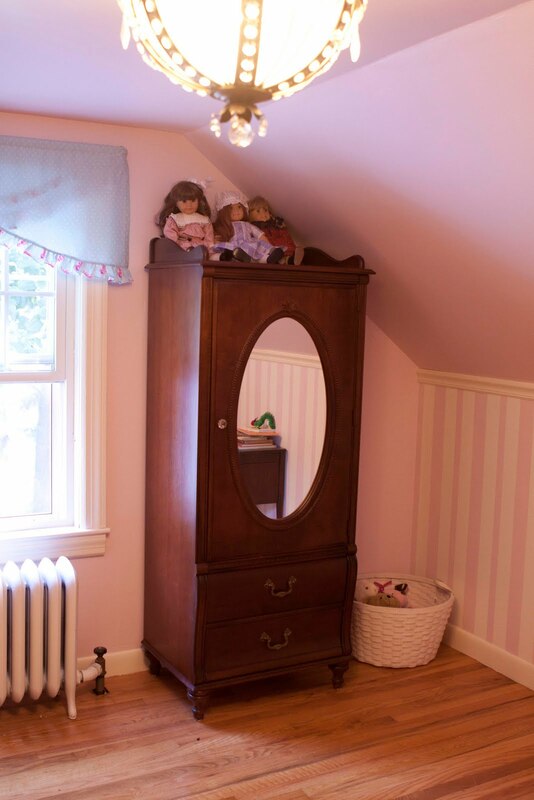 The paint color is a pale lavender (with a pinkish tint). 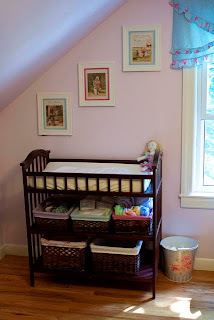 Here you can see the changing table. 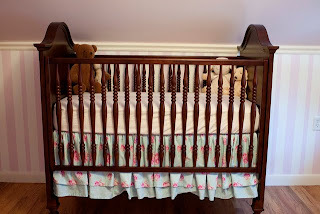 The crib and armoire are in the same collection (Stanley Young America), but the changing table is from Target! 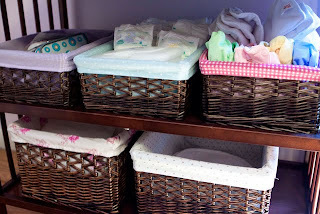 I added some baskets and made new liners for them - easiest project in the whole room! 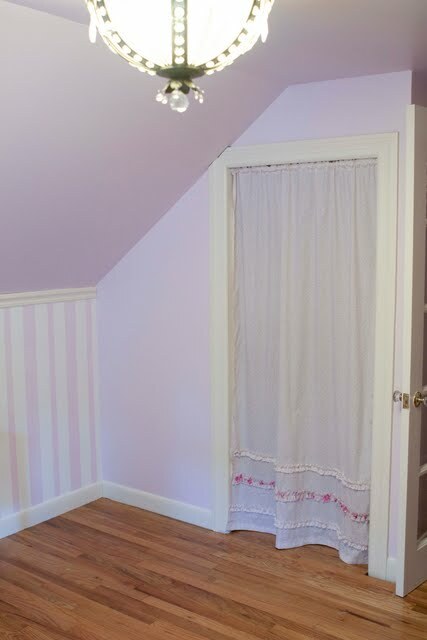 The rocking chair will go in this corner. As you can see, the closet is in an awkward spot for a door. It is also shorter than a regular door. When our house was built, "standard size" must not have been popular! I made a fabric curtain instead. 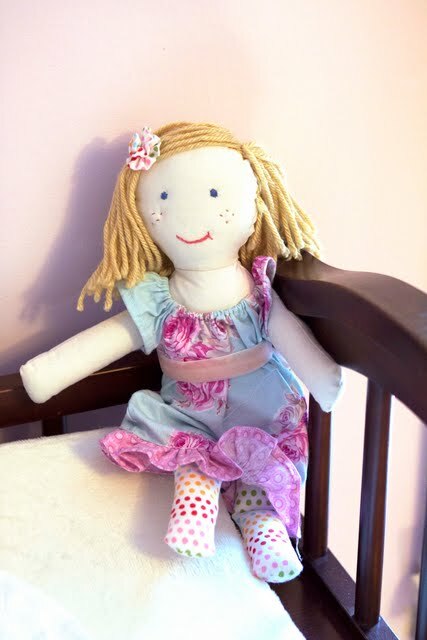 The fabric is a pale lavender pattern from Joanns and is SO soft! 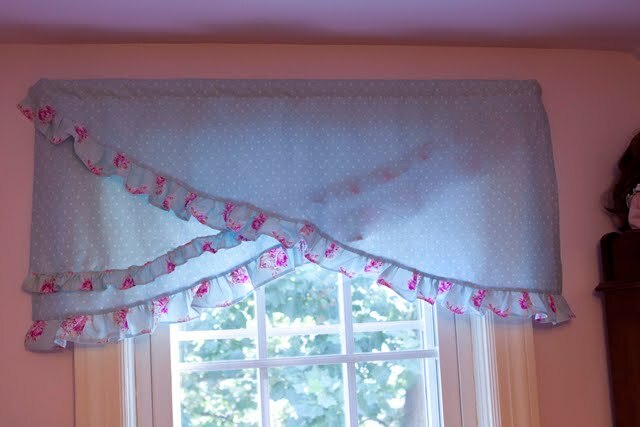 The crib sheet is also made from this fabric. I love it! I love the wall hanging my aunt and grandmother got for the baby's room! It goes so well!!! Here is the lovely armoire! 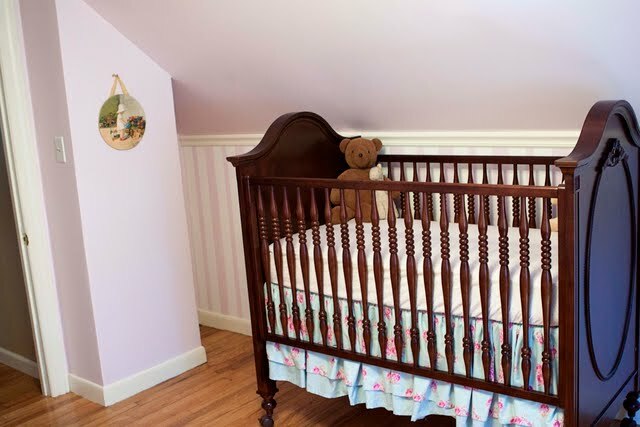 We still need some more things, but the room is clean and mostly done and waiting for its little inhabitant (although she won't be spending time in there for a while!!). I have the tutorial for this little lady about 85% finished. Provided I don't go into labor, I will post it this week! Sorry it has been so long! I'm dying to post more projects and tutorials! I must add - LOTS of hard work went into this room. My husband and mom did SO much painting throughout the whole house. My dad helped as well! I am so thankful for them! Keri, it's beautiful! 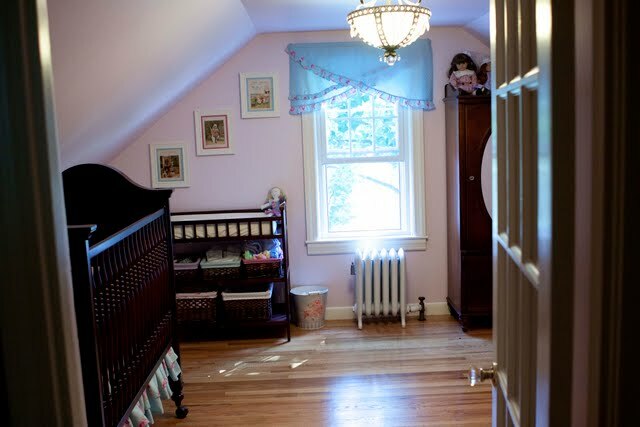 I'm sure your darling daughter will be very happy in this room when she gets to use it! Praying for you and your little family for a safe and healthy upcoming birthday! It looks straight out of Eloise Wilkin. I love it! Your room looks very cute. 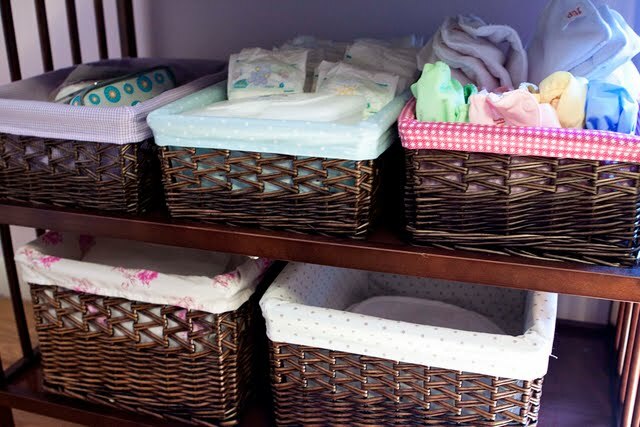 It's amazing that the changing table from Target goes with all the other furniture. Thank you, everyone! Baby Girl is *still* not here to enjoy it! All of it is so lovely! What a lucky little girl she will be. Hoping you have an easy delivery and a peaceful arrival of your angel. Sweet sweet baby girl room!